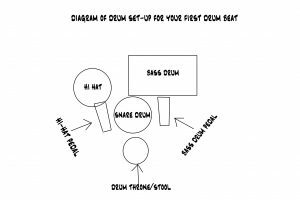 Have you wanted to play drums for a while, but you weren’t sure how to get started? Let me guide you to playing your first drum beat. It’s OK if you’ve never played before and it doesn’t matter if you can’t read music. This is a pretty-much full proof way to get started. situate your left arm so that your left hand can strike the snare drum with the stick. Hit the Hi-Hat with your right hand. If you play these steps in their numbered order, and repeat them very slowly over and over, while spacing the steps evenly, you’ll begin to play your first beat. repeat the steps over and over again, and loop them, so you’re playing 1, 2, 3, 4, 1, 2, 3, 4 etc..
repeat this a LOT — until you can do it with ease. If you don’t have a drum set, or even sticks, you can still practice this. Just make the correct motions with your body in the proper order and you’ll still be practicing the coordination needed to play this beat. You can bring it to the drum set later.